The new operating system from OnePlus, based on Android 5.0.2 OxygenOS is light and essential with subtle, useful features. 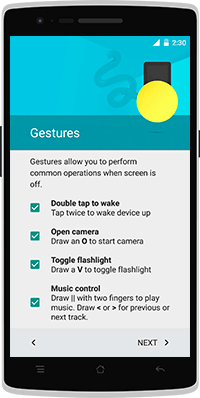 Several original OnePlus features have been built right into OxygenOS, including screen-off gestures like double-tap to wake, music controls, and shortcuts for the camera and flashlight. 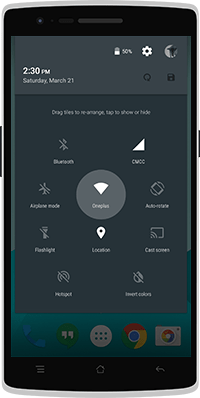 With its new quick settings feature, tiles can be added, removed, and re-organized with the click of a button, and it blends beautifully right into the notification tray’s UI. It just makes sense. 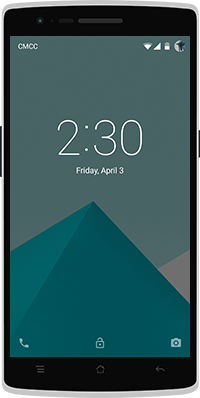 With customizable lockscreen wallpapers and the ability to switch between hardware and software navigation keys, OxygenOS allows you to make your phone distinctly yours. Note: You’ll need to enable installations from unknown sources (settings > security) in order to install the feedback app on OxygenOS. Please make sure all your data and files are backed up before commencing. Flashing OxygenOS onto CM does require a system wipe, so you will lose all of your data. We are actively working on an easier, more automated solution soon to be available, but for now the build must be flashed manually. Please proceed only if you are confident in your abilities to flash a custom ROM. This guide exists to help you flash OxygenOS, but things can still go wrong if not followed correctly. While rooting and flashing will not void your OnePlus warranty, any damage caused by improper flashing is not covered under warranty. The following instructions assume you have Fastboot and ADB installed. Boot into fastboot mode. You can do this on your OnePlus One by holding down the power button and the volume up button. When you see the fastboot logo, connect your device to your computer. fastboot oem unlock (You can skip this step if your phone’s bootloader is already unlocked). fastboot flash recovery <recovery.img>. Image file should be the TWRP recovery image. ./fastboot oem unlock (You can skip this step if your phone’s bootloader is already unlocked). ./fastboot flash recovery <recovery.img>. Image file should be the TWRP recovery image. Unzip oxygenos_1.0.0.zip. In there, you will see a oxygenos_1.0.0.flashable.zip file.Copy oxygenos_1.0.0.flashable.zip to your phone. On a Mac, you can use Android File Transfer. Boot into recovery. You can do this on your OnePlus One by holding down both the volume down key and the power button. Once you are in the recovery interface, the first thing you want to do is a factory reset. Again, you will lose all your data so please make sure you have backed up everything before doing this. After the wipe, go to install and find oxygenos_1.0.0.flashable.zip. Confirm flash. This will flash OxygenOS onto your device. After the flash succeeds, you can reboot the device, which will take you to the new OxygenOS. Enjoy! If you find yourself wanting to rollback to CM, Make sure you have TWRP or CM recovery on the device. Another factory reset will be needed before flashing unfortunately so make sure you backup all of you data. ← Get free Microsoft certificates! Thanks for sharing all the information about OnePlus ONE PLUS NEW OS OXYGEN install. I am a regular follower of your site, and it seems its authority has increased a lot in last few months. I will recommend your site to my friends for sure.